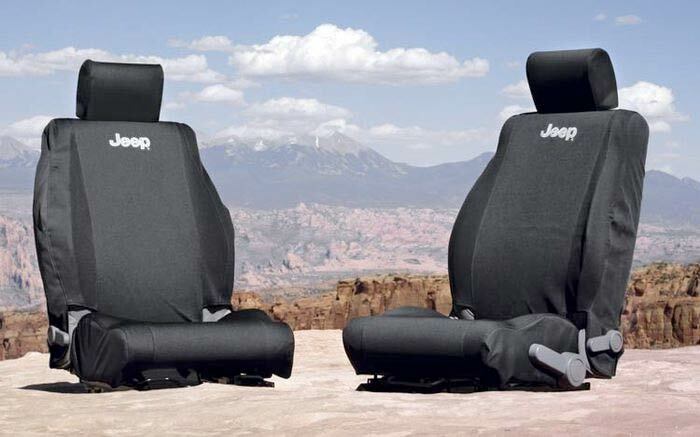 Make sure you're protecting your Jeep's back seats with Wrangler rear seat covers from JustforJeeps.com. These custom-tailored rear seat covers won't get in the way of seat controls, and they're made from a comfortable, durable fabric. Save your seats from dirt, tears and other damage with these easily removable Wrangler rear seat covers, which are available in black or in khaki and black. Rear, 2 or 4 Door, Black or Khaki and Black Wet Suit-like material. Please choose year, model, and color above. 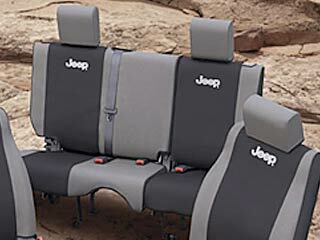 Khaki/Black combo for the back seat has one Jeep logo in the middle of the seats. The photo is only for color reference. Purchased rear seat covers to protect when my two dogs are riding with me. They fit great and look awesome. Look good and fit nice. Not absolutely perfect fit but ver good. Purchase front and back for 2014 jk. I would recommend to a friend. Pic shows black and gray but verified before purchase they are all black.